Use this single source to uncover the origin and development of the thesaurus! 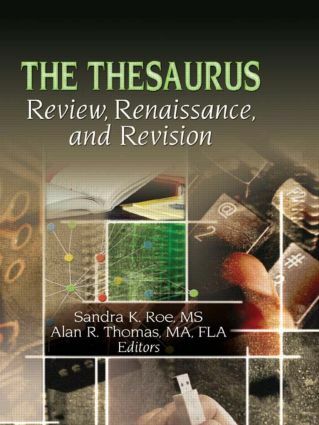 The Thesaurus: Review, Renaissance, and Revision examines the historical development of the thesaurus and the standards employed for thesaurus construction. This book provides both the history of thesauri and tutorials on usage to increase your understanding of thesaurus creation, use, and evaluation. This reference tool offers essential information on thesauri in the digital environment, including Web sites, databases, and software. For 50 years, the thesaurus has been a core reference book; The Thesaurus: Review, Renaissance, and Revision celebrates this history and speculates on the future of vocabulary-switching tools. This book will familiarize you with contemporary and emerging functions of thesauri, including international and multilingual developments. The Thesaurus: Review, Renaissance, and Revision provides information and library professionals—including indexers, abstractors, subject catalogers, classifiers, and reference librarians—a historical overview of the thesaurus and its past as well as recent developments. This book also gives patrons, readers, and researchers more effective techniques in vocabulary management and offers insight on how thesauri are devised and compiled. The Thesaurus: Review, Renaissance, and Revision also provides you with extensive bibliographies related to issues and problems in thesaurus construction and design, such as developing standards in support of electronic thesauri.